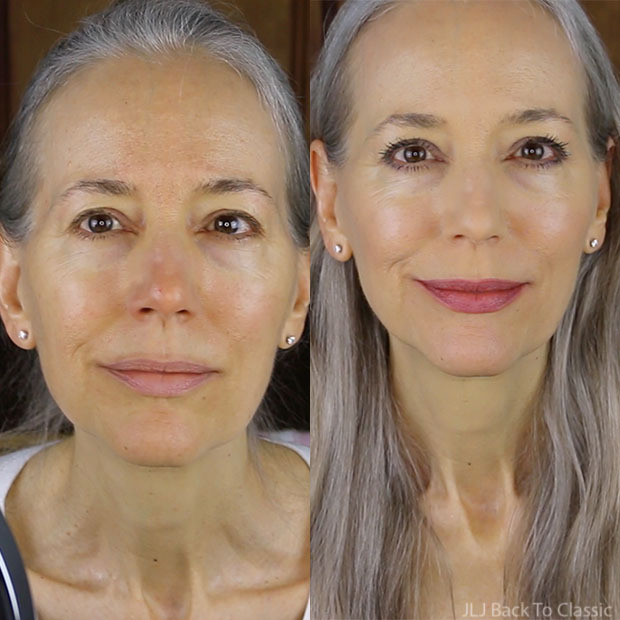 (ABOVE) Before and after using BareMinerals Matte Mineral Powder Foundation and RMS Beauty Lip2Cheek. MATTE MINERAL FOUNDATION & MATTE LIP & CHEEK TINT ON DRY, MATURE SKIN? I tend to prefer a luminous look to my skin, whether or not I’m wearing makeup. I don’t want my skin to look oily, of course, but I also don’t want it to look flat and dry. That only emphasizes my wrinkles and age spots. 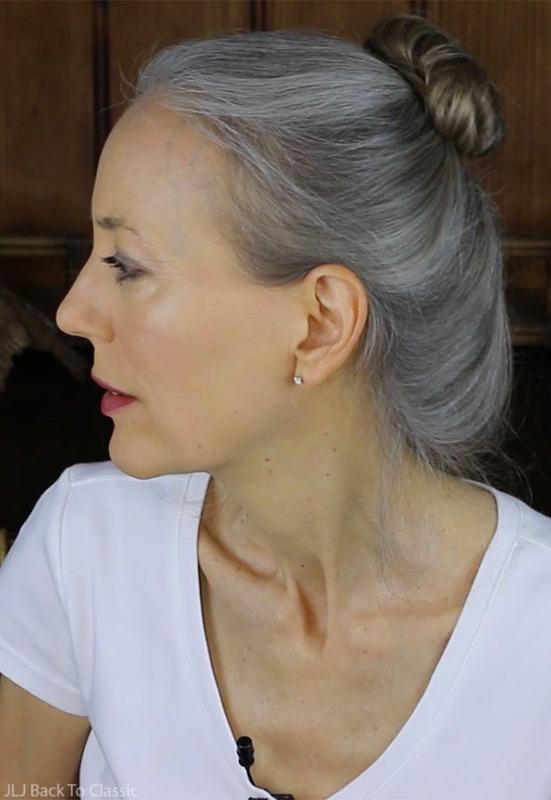 In this Get Ready With Me video (GRWM), I review and show how I used two new matte products, BareMinerals Matte Powder Foundation and RMS Beauty Lip2Cheek to get the final look you see above. I like the idea of using matte makeup, because then I can create the luminosity I want–with highlighters and/or moisturizers. Sometimes foundations and blushes can be too luminous, and I feel the effect is so shiny on me, I look greasy. Not good. For a quick overview of how I went from bare skin to the finished look you see above, scroll down the page. For the video in which I go into more detail, skip to the bottom of the page. P.S. At the end of this post, I also show what I use to hold my hair in the loose bun I wear in this video. STEP ONE:. Exfoliate and condition face and lips (I used a homemade organic face scrub of organic coconut oil and Himalayan salt). 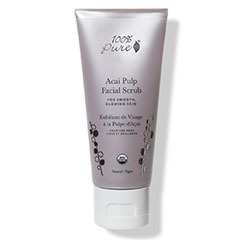 ABOUT FACE SCRUBS: If you prefer an organic scrub pre-made, you might try 100% Pure Organic Acai Pulp Facial Scrubber. 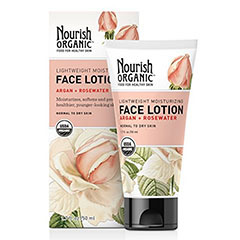 The ingredients are almost all organic, and after using it just once it did make my skin feel soft and smooth. However, if you’re very sensitive or have allergies like me, this might not be for you. When I left it on as a mask for a few minutes per the instructions, it gave me a headache, so until I find something better I’ve been sticking to my homemade scrub. STEP TWO: Next, moisturize face and neck with an organic moisturizer (I used Nourish Organic Face Lotion), followed by tapping an organic butter under eyes and onto lips (I used Nourish Organic Shea Butter). Wait at least 15 minutes for the moisturizers to absorb into skin before applying makeup. FIRST IMPRESSIONS: BareMinerals Matte Foundation offers a true matte finish, and I definitely liked it better when I applied a hint of shea butter over it as a highlighter on my cheeks, cheekbones, and brow bone, where I tend to look the driest. (Alternatively, you could use your regular moisturizer over the foundation in these areas if you don’t want as luminous a look.) I also like that it offers full coverage if I want it. So, all in all, I think it’s a winner. 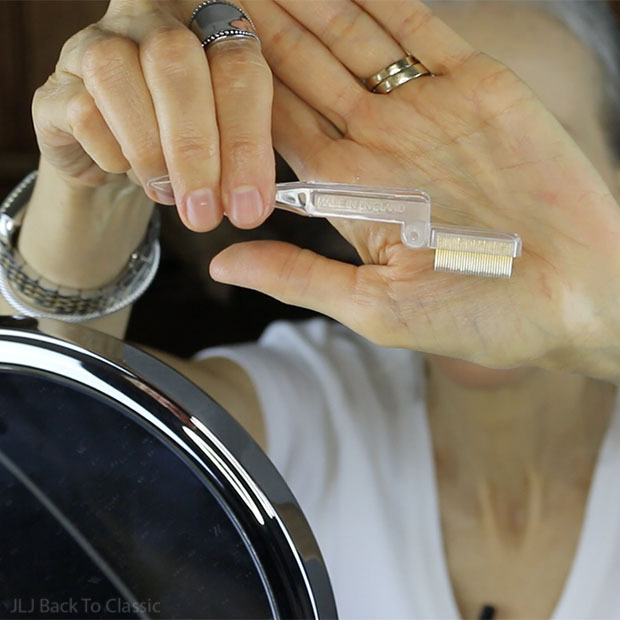 STEP ONE: Dip a BareMinerals Flawless Application Face Brush (also available here) into the BareMinerals Matte Foundation, and tap off excess. Then, gently tap/press the powder onto face, upper eyelids and, if needed, your neck. 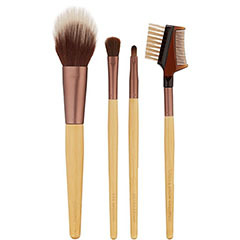 The BareMinerals Flawless Application Face Brush is perfect for lightly/gradually applying the foundation all over the face to create either a final look or an initial, starting light-to-medium base. 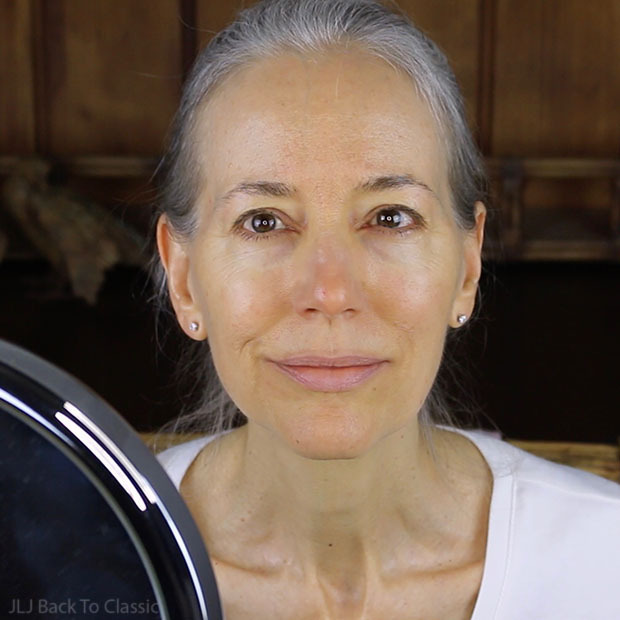 If you’re like me and need further coverage in large, troublesome areas (in my case it’s the dark patches on my cheeks, forehead, and nose), then move onto STEP TWO. Otherwise, you can skip this step and move onto eyeshadow or mascara. ABOUT BAREMINERALS MATTE FOUNDATION SPF15 : BareMinerals offers two loose-mineral powder-foundation formulas: original and matte. While the original formula has Bismuth Ocychloride (which can cause itching, rashes, and breakouts), the matte formula doesn’t, so I felt comfortable trying it. 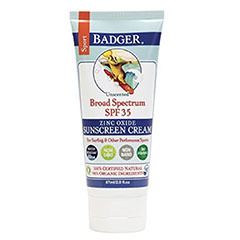 It also offers an SPF level of 15, which is great. ABOUT FINDING YOUR FOUNDATION SHADE: If you are like me and can’t find a shade close enough to your own skin tone, choose two and mix them together like I do. I have yellow-tone/olive skin, so I chose Golden Medium 14 and Golden Fair 04. 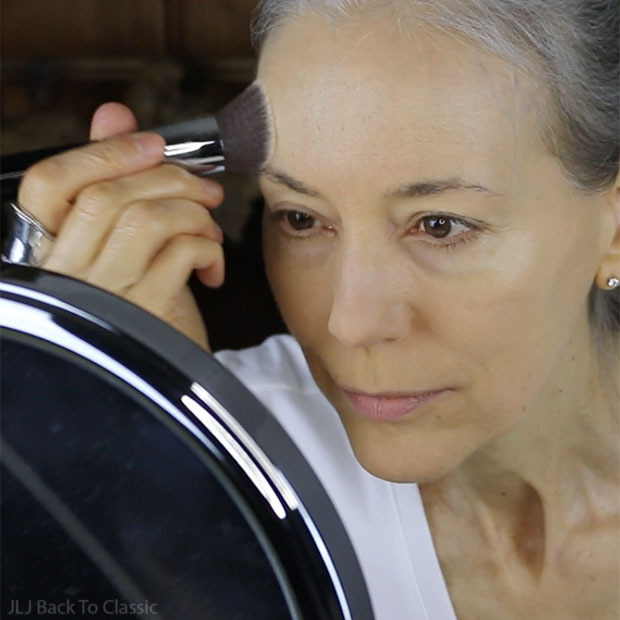 STEP TWO: With a Sigma Flat Angled Kabuki F88 Brush, gently tap/press the foundation onto large, troublesome areas, avoiding placing too much in places with deeper wrinkles or large pores (putting too much foundation on these spots emphasizes the issues). The Sigma Flat Angled Kabuki F88 Brush is perfect for applying buildable, heavier coverage (medium to full coverage) over large areas of the face. I use this brush for giving me more coverage over my cheeks, nose and forehead, where I have large areas of dark or red patches. 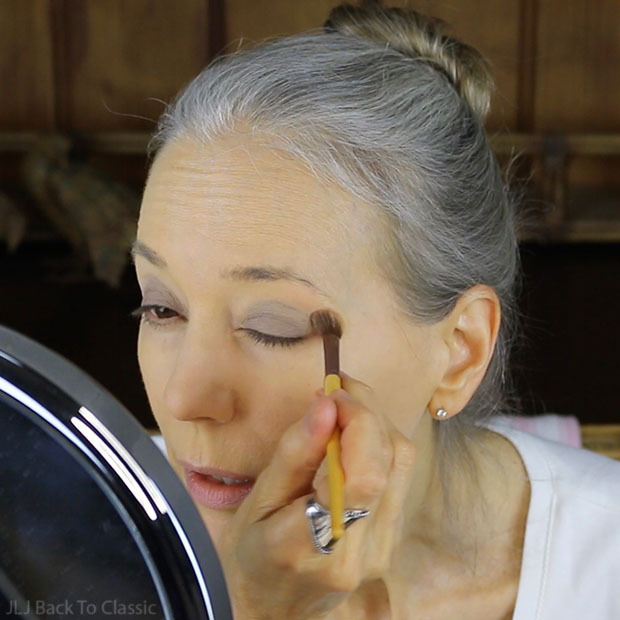 STEP ONE: To prep lids for eye shadow (and instead of primer), tap powder foundation onto eyelids and below lower lashes with a clean, fluffy eye shadow brush (I used the fluffy Eye Shading Brush from the Eco Tools Touch Up Set). 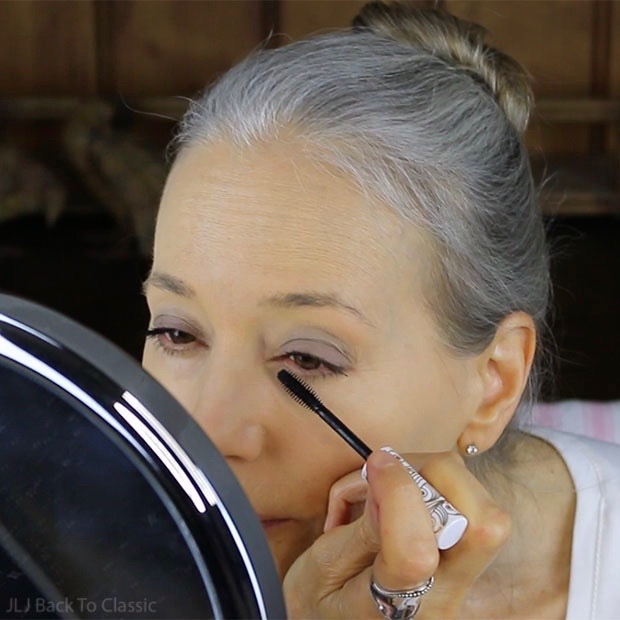 ABOUT SWEEPING THE BRUSH: Most makeup artists sweep a brush back and forth over this line in a windshield-wiper motion to soften the edges of the eye shadow. However, doing this on my fragile, dry upper eyelid creates too much friction, making it look even more dry and textured. So, I sweep downward, very gently, onto the moveable lid. For some reason sweeping the brush in a downward motion creates less friction on this fragile area and works much better for me. STEP FOUR: This step is only necessary if you feel like the demarcation line is still stronger than you’d like it to be. 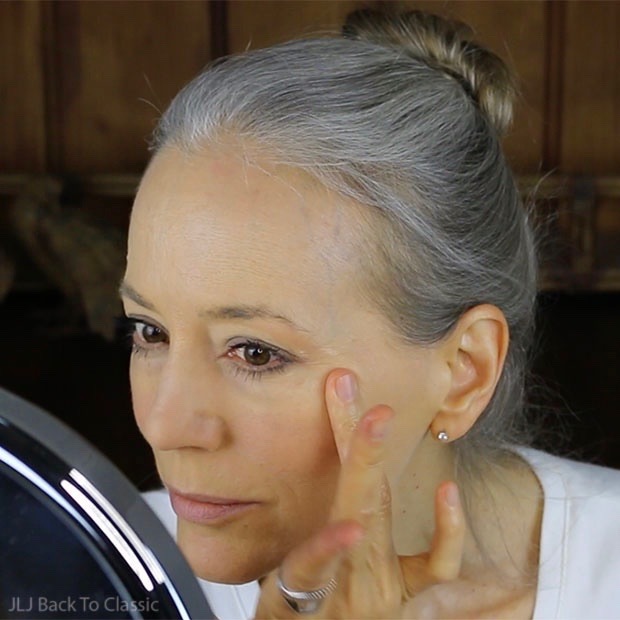 Simply dip the same clean, fluffy eye shadow brush into your powder foundation, and apply it to the demarcation using a gentle tapping/pressing motion. STEP FIVE: Using a small, clean, compact eyeshadow brush (I used the Smudge Brush from the EcoTools Six-Piece Essential Eye Collection. 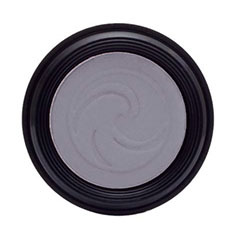 ), buff eye shadow under lower lashes, sweeping the color from outer to inner corner. 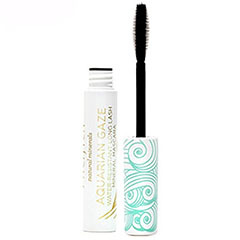 STEP ONE: Apply a natural/green-beauty mascara (I used Pacifica Aquarian Gaze Water-Resistant Mascara, Abyss) to top and bottom lashes. (I usually comb out mascara, but if you want your lashes to be thicker, longer and more dramatic, you can skip STEP TWO and move on to blush). 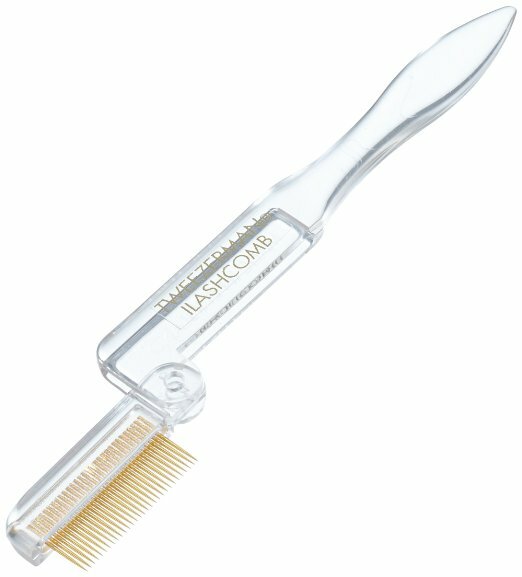 STEP TWO: With a fine-toothed comb (like this Folding Eyelash Comb with Metal Teeth), comb out top and bottom lashes. Note: Place a tissue under lower lashes when combing them out to keep from getting mascara on lower eye area. 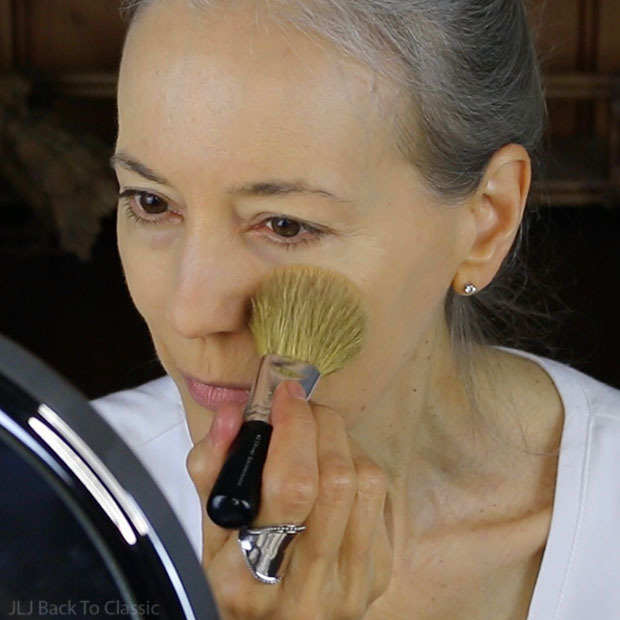 STEP ONE: To avoid applying too much blusher at once, use a stippling brush (I used the Eco Tools Stippling Brush) to tap/press RMS Beauty Lip2Cheek, Diabolique, onto apples of cheeks and outward; then also onto the forehead, upper temples and, if you wish, also on bridge of nose for a sun-touched look. 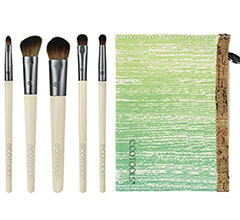 This stippling brush applies both wet or dry products very lightly, allowing you to build color gradually. 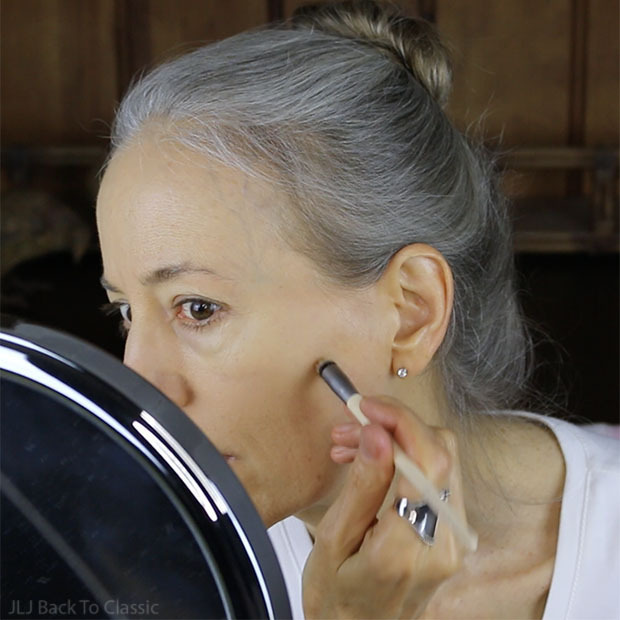 STEP TWO: Soften any harsh edges by very gently sweeping over with a clean foundation brush (I used a second BareMinerals Flawless Application Face Brush that I have expressly for this purpose). STEP TWO: For a more luminous appearance to cheeks (and for added moisture to dry skin like mine), tap a small amount of shea butter onto cheeks as well. 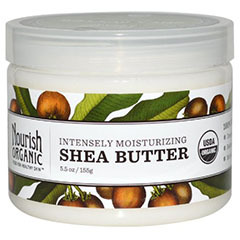 Let the shea butter absorb into skin for at least 15 minutes. STEP ONE: While letting shea butter absorb into skin on cheeks, cheek bones and brow bone, blot any excess shea butter from lips (applied with moisturizer at beginning) and use a lip brush to apply RMS Beauty Lip and Cheek Color, Diabolique, to outline of lips. STEP TWO: Fill in lips with the lip color, using either finger or same brush. Note: My lips are more defined on the top and less defined on the bottom, so I chose not to smudge my top lip line, but did smudge my bottom lip line with my fingertip to create a more natural lip look. STEP ONE: Having let the shea butter absorb into skin for at least 15 minutes, now blot with a clean, dry fingertip to remove any excess. STEP TWO: Touch up any eye makeup mistakes with clean cotton swab. STEP ONE: Remove Goody Spin Pins from loose bun. 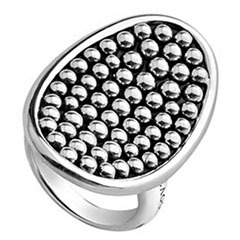 ABOUT THESE PINS: I’ve had these for years and love them because just the two pins alone hold my hair securely in a loose bun, which I wear for swimming, sunbathing, taking a bath, and sometimes just while working at home. It’s a great way to get my hair up and out of my way without causing tension at the roots. I don’t often wear my hair out this way, simply because I almost always wear a wide-brim hat, and the hat won’t fit on my head with my hair this way. When I sunbathe and swim, however, I wear a wide-brim visor, which does accommodate a high bun or ponytail. STEP TWO: Comb out hair and style as usual. 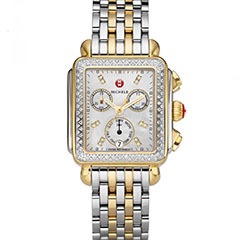 RING: Lagos (Similar; also Here) / WATCH: Michele Deco Diamond (also Saks Fifth Avenue, Michele) / BRACELETt #1: David Yurman / BRACELET #2: David Yurman. 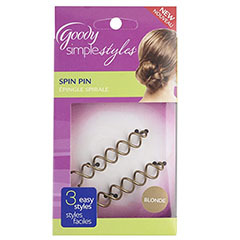 HAIR PINS: Goody Spin Pins. FACE SCRUB: Coconut Oil Mixed with Himalayan Salt (alternative 100% Pure Organic Acai Pulp Facial Scrub) / FACE MOISTURIZER: Nourish Organic Face Lotion / LIPS-EYE AREA MOISTURIZER: Nourish Organic Shea Butter / FACE MAKEUP: BareMinerals Matte Foundation SPF 15, Golden Medium 14 and Golden Fair 04, applied with BareMinerals Flawless Application Face Brush (also available here) and Sigma Flat Angled Kabuki F88 Brush / CHEEKS: RMS Beauty Lip2Cheek, Diabolique, applied with EcoTools cruelty-free Stippling Brush / LIPS: RMS Beauty Lip2Cheek, Diabolique (applied with a lip brush and fingertip) / LASHES: Pacifica Aquarian Gaze Water-Resistant Mascara in Abyss, combed out with this Folding Eyelash Comb With Metal Teeth. Seriously, I think you look great! I have switched to the same foundation. I should have done that years ago. I love your eyeshadow. That is one area I am still struggling. Love all the tips. I simply must try the Shea Butter. As for the previous commenter, I have been on a health journey for about 4 years now. I see a wellness doctor. I tried the biodentical hormones. They were not for me. My husband takes them and they have made a huge change in his energy level. They did not feel good on me. In fact, my doctor and I are in agreement with that. I am actually having a bit more thyroid problems that we are working on. I am doing great. I love when people suggest ideas, because I love to learn, but not so harshly recommend them. I am so glad to learn about these spin pins! I have such a hard time getting my granddaughters long fine hair to stay in a bun. I will look for these asap! The make up looks so pretty on you but I don’t think I could wear powder for a foundation because of my dry skin. 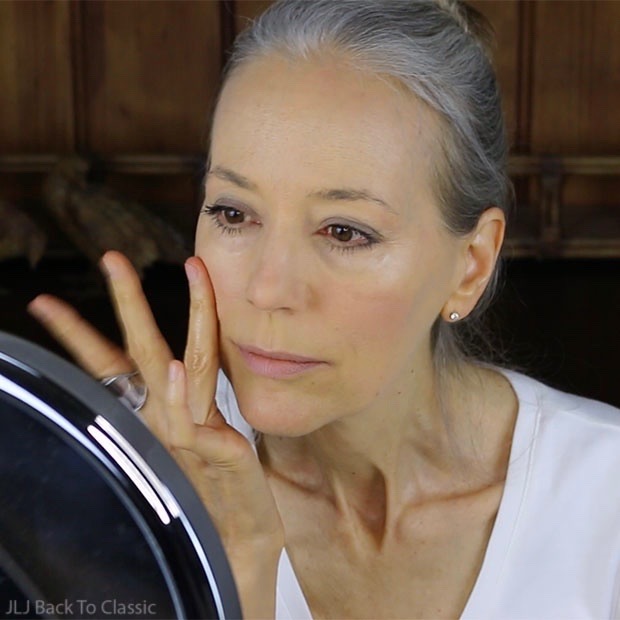 I am like you though, I like a dewy look for my 60 year old skin. Your long her reminds me of the classic beauty of Franca Sozzani. She used to color her hair Platinum Blond. You look splendid in gray. Please continue applying mascara on your lower eyelashes. It does a lot for the completeness of the makeup look. You can afford it since you don’t wear fake eyelashes and heavy makeup. NO hormones either. Don’t fight nature. With your diet and lifestyle you are taking excellent care of your whole body. Women like Franca and you, Janis, inject power and confidence in all of us girls… 😉 Love of beauty in nature, fashion, and personal space and surroundings with plenty of details that give us comfort and a sense of peace because of their sentimental value and loveliness are treasures and a life style not to ignore and to treasure : – ) Tremendous hug for you dearest Janis. Thank you for your contribution. I didn’t add the address since I didn’t want for it to look impersonal when I wrote my previous comment. Your makeup looks lovely on you and I think you should wear and apply what you like. Personally I thought the mascara on your lower lashes completed your eye make up look. Thank you for putting your blog out for followers to enjoy! Love the way you do your makeup…..always have……certain things may not look good on everybody, but they look good on you! I love your makeup. I was wondering what the recipe is for the coconut oil salt scrub. What kind of coconut oil do you use? I am trying to use mineral powder foundation but my skin is flaky. Thank you for this blog and your videos. 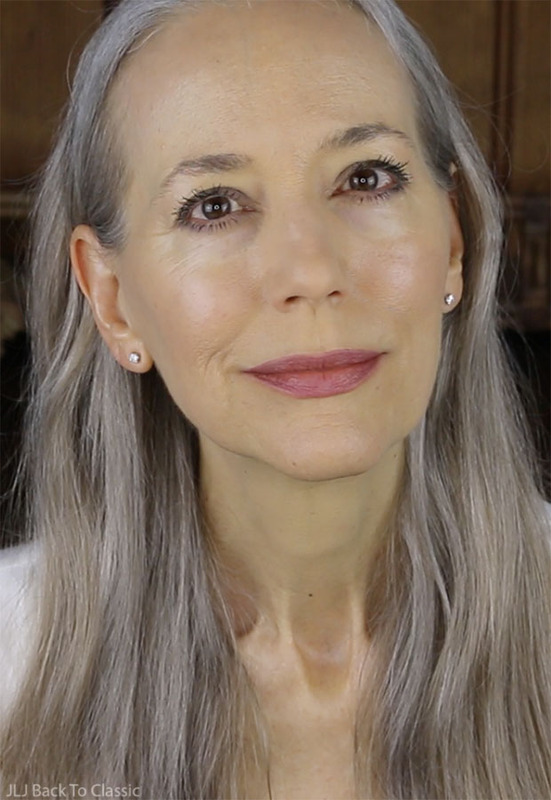 I noticed my eyebrows growing every which way at the age of 56 and I have never had my eyebrows trimmed. So I guess it is just a natural process. I have Bared minerals powder, but started using their tinted hydrating gel cream when I re-entered the work world. When I did use the powder, I swirled it on as they suggest. I will try the dabbing/pressing method you use and see how that works for me. 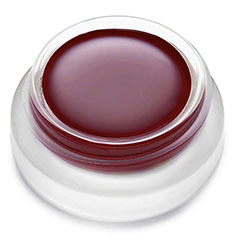 I definitely will be looking to try the RMS lip stain! I currently use liquid (2 different brands) and they do dry out my lips. Thank you for the video! It’s nice to put a voice to your pretty face!! Caution re. Castor oil… may I suggest consulting with an eye doctor? You might try shea butter generously applied to and then lightly brushed or smoothed in the direction of your brows … in the evening or anytime you are at home. Try it for two months to see if it makes a difference. Thanks for sharing your routine…gorgeous as usual. Castor oil is perfectly fine. If you Google the ingredient list of Restasis, a prescription drug for dry eyes, you will see that castor oil is the second non-medicinal ingredient. Thank you Janis once again for never disappointing us. Your natural approach has richly rewarded you ? as you are looking younger by every video. You don’t have to change one thing ? Natural look was outdoes any face over done with too much make up & too much botox. Greatly appreciate all videos ?always look forward to the new ones. Please could you tell us how much excersise you do per day. What do you recommend for a healthy breakfast. Thanks to you Janis I tried the Organic Shea Butter and it is doing wonders for my skin in my dry areas. I am also wearing Gabriel cosmetics now (eye shadow and blush). I LOVE Gabriel!! I am learning so much from you in fashion, skin care and makeup! 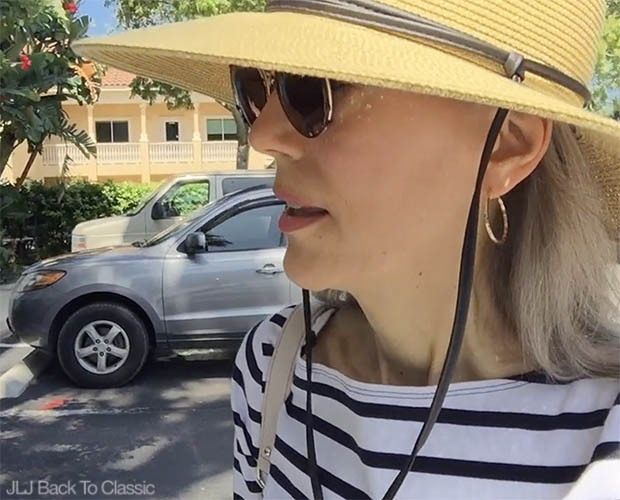 From one Florida girl to another thank you for this video, I hope you will do more! 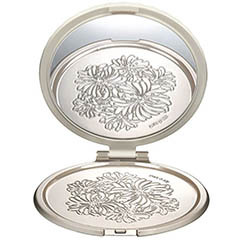 What is the beautiful silver compact you are using in so many of your videos? I love it! I am so happy I recently found your blog and youtube videos! I am actively trying your methods, and will hope for the best! 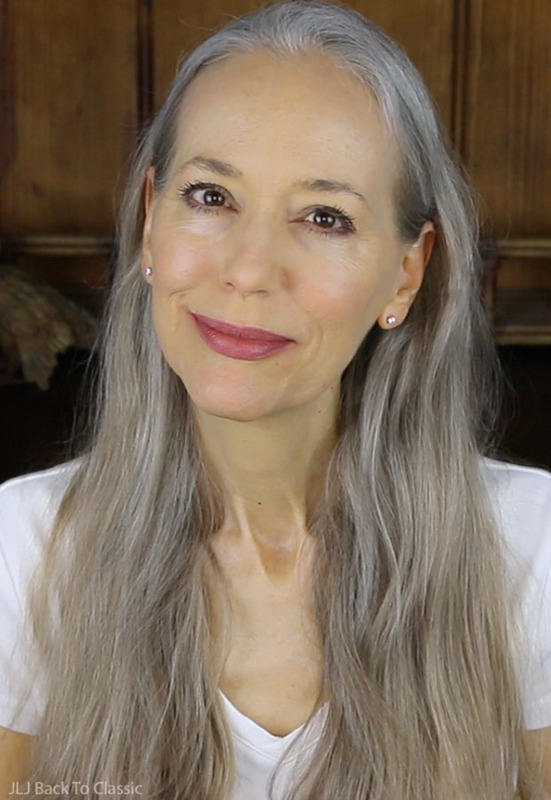 I’m 62 and the face & neck are really starting to show my age … I must do better. Had shea butter I haven’t used in quite a while … used it last night as night cream, and this morning on my face … using on lips … marvelous!! I will dump the long-time favorite (spearmint lip balms from Trader Joes). I went out at lunch and bought what I hope will be the right shade of Bare Minerals Matte Foundation, too. 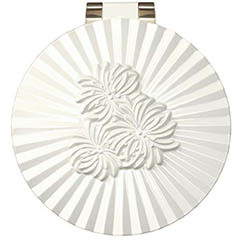 I have several eyeshadows and blushers I like from Alima Pure; are you familiar with that company? You are simply a lovely gal, and you look so very healthy! Your how to apply makeup videos are the best I’ve ever seen!!! I am going to try to embrace some of your healthy eating tips, and I really look forward to purusing your blog further! You look lovely!! 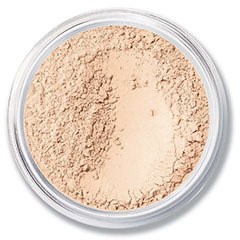 Do you like the Bare Minerals better on your skin than ZuZu Dual Powder Foundation? Which stays on throughout the day? Thanks so much for sharing your natural beauty routine! Really glad that I found you on IG. Classic, timeless style has always been my preference. 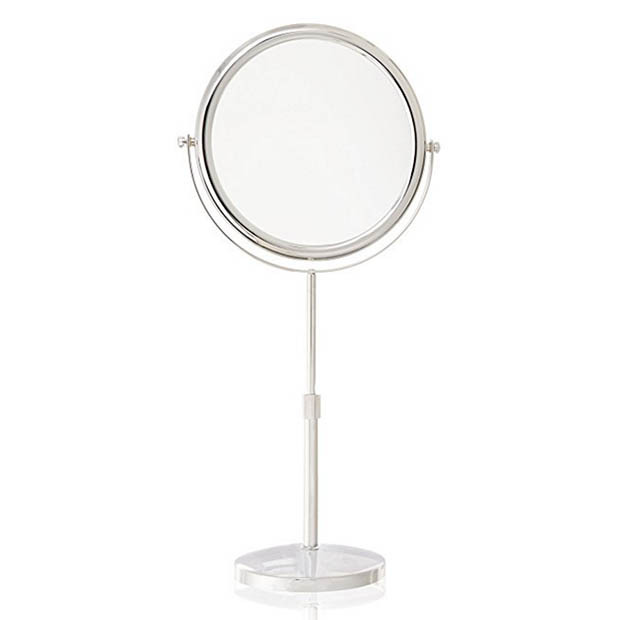 With thyroid problems, I am beginning to embrace healthier makeup options, so your blog/videos are extremely helpful. Your makeup is gorgeous and I am definitely going to try it. Also, your diet choices are helpful. Your honesty and willingness to share with us is endearing and beneficial. Please keep sharing and inspiring us all!